God of the Trees is a thoughtful book of scripture based meditations on eighteen different kinds of trees; trees which were key to a series of critical events found in the Holy Bible. From the mighty oak to the lowly hyssop; from the beloved fig tree to the wilderness-dwelling acacia, the author's thoughtful insights provide a number of illuminating glimpses into the wonder of God's astounding creative powers. Even some of Scripture's most familiar analogies refer to a number of different trees: such as followers being rooted in Christ and bearing good fruit for Him. As well, many of the most dramatic incidents of the Bible took place beneath trees: Eve's temptation, Christ in the Garden of Gethsemane, the Lord's calling of the tax-collector, Zacchaeus, the angel's visit to Elijah when he was beneath the broom tree in the wilderness and many more. Still other trees are used in the Bible's most cherished poems: the almond, the pomegranate and the willow. 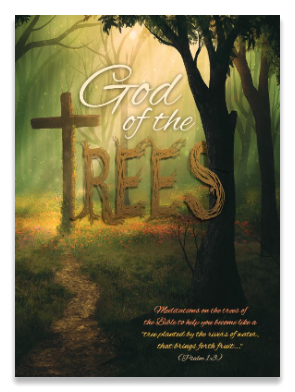 God of the Trees provides the reader with a wealth of devotional reflections on one of the Lord's most magnificent creations, the tree.